PlantGenesis seeds are packet in our premises in Cornwall. We are in the process of switching from foil laminated packets to paper packets during 2019. We are doing this so that all our customers can recycle our seed packets, either in your compost, or added to your paper recycling boxes or bags. You may notice your orders in 2019 contain a mix of old and new packaging while we switch over. The new brown packets are unbleached and exclude light, which helps to keep your seeds in good condition. You can keep surplus seeds in these packets in a sealed container in a fridge or cool place, and most stay viable for many years. Seeds come in a variety of shapes and sizes. Smaller seeds are packed in small glassine bags within the seed packet. Larger seeds go straight into the packet. Our product pages let you know when seeds are very small. Clean seeds: We normally pack cleaned seeds, where all dead plant material and debris is removed. Sometimes seeds have tails or fluff, and these are often left on the seed. Bulk seeds: We occasionally pack bulk seed, where the seeds are still covered in various plant material. We let you know on the product pages if this is the case. Pelleted seeds: A few seeds are coated or pelleted by seed breeders. This is done to help with the handling and sowing of very small seeds, or to protect seeds vulnerable to fungal infection. We let you know if seeds are pelleted before you buy. Pre-treated seeds: Some seeds are treated by the seed breeders to help germination, often to eliminate the need for cold treatment during germination. We let you know if seeds are pre-treated before you buy. These seeds typically do not store as well as untreated seeds, so you should plan to sow them in the season that you buy them. Do plants grown from seed all look the same? Plants grown from seed can show a range of form and colour, and you do not always get exactly what you expect. Original species: Plants grown from the seeds of original species tend to show the most variety in form and colour, but it does depend on the species. 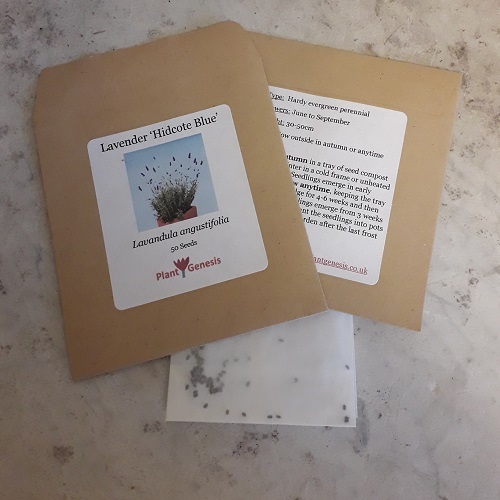 Plants from the same batch of seed are similar, but they may not germinate at the same time, and some may be taller/shorter, flower in a different shade of colour and flower earlier/later than others. Named varieties: Some named varieties of plants grow true from seed - there will still be some variation in form and colour but not much. We focus on selling only those named varieties that grow true enough from seed. F1 hybrids: F1 hybrids are the result of two or more species of plants that are backcrossed - the plants all grow true from seed. Plants from the same batch of seed have the same form and colour and all germinate and grow at the same rate. Most of the available F1 seeds are vegetables, but there are flower seeds too. They are expensive to breed and the seed is often more expensive to buy than conventional seeds. The plants have the advantage of being predictable and may include some added resistance to disease. The seed of F1 hybrid plants, called F2 hybrids, do not flower true to form. You need to buy new F1 seed every season if you want the same plants. F2 hybrids: F2 hybrid seed comes from F1 plants that have flowered, pollinated and produced their own seed. They typically show a mix of flower colour and forms reflecting the various species giving rise to the hybrids. They are often sold as colourful flower mixes. In summary, expect some variation in germination times and forms and colours. This is one of the joys of growing plants from seed. Where does PlantGenesis get the seeds? We mostly buy our seeds from specialist seed breeders and botanic gardens. The seeds are repacked on our premises in Cornwall, and we control the conditions in which the seeds are packed and stored. Our seeds live in low humidity fridges.